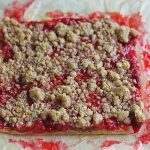 When considering Pennsylvania Dutch cooking and baking, one particular pie stands above the rest. 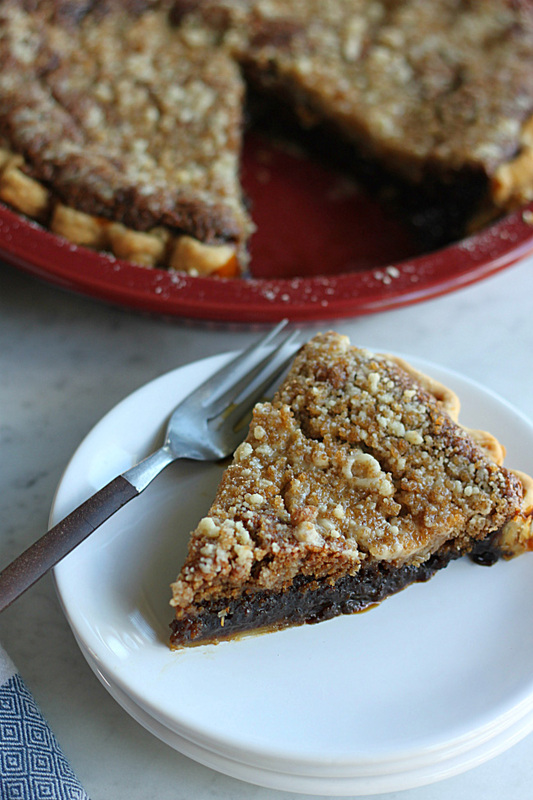 I guess you could say it “takes the cake.” 🙂 Pennsylvania Dutch shoofly pie has been and is still a favorite among the Amish and Mennonite communities here in Lancaster County. 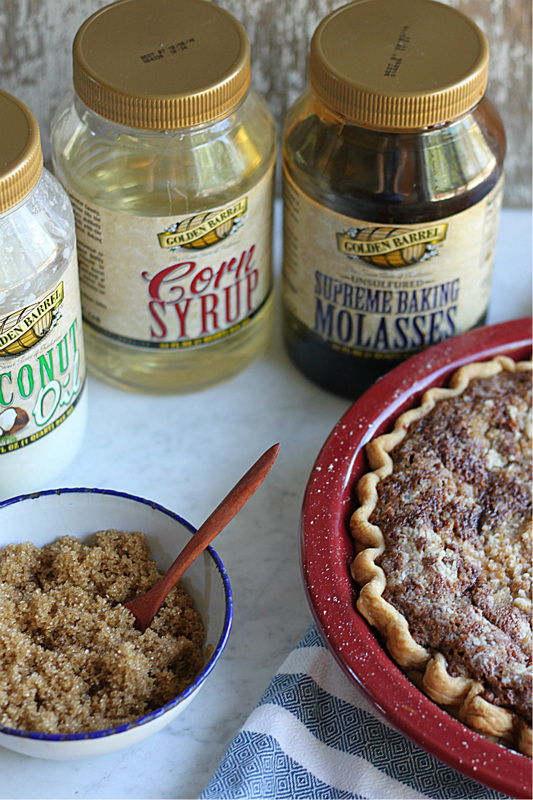 This sweet, sticky pie is a must-try for any pie enthusiasts out there. 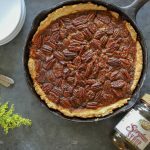 There are more than a couple versions of this pie in Lancaster County cookbooks and on recipe boxes. 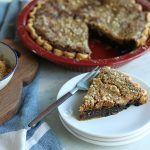 Actually I had been wanting to make a shoofly pie for quite some time now, but when I started researching it, I was quickly overwhelmed with all the different varieties of this Lancaster County staple. Everyone here seems to make it slightly differently, but all swear their’s is the best. 😉 Some have spices in it, while others let the molasses speak for itself. Some recipes use baking molasses while others, table syrup. 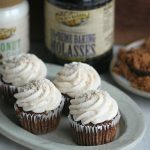 This particular recipe was adapted from an Amish community cookbook out of Greenville, PA, which is located in the northwest region of the state and uses both baking molasses, corn syrup, and brown sugar to achieve its sweetness. 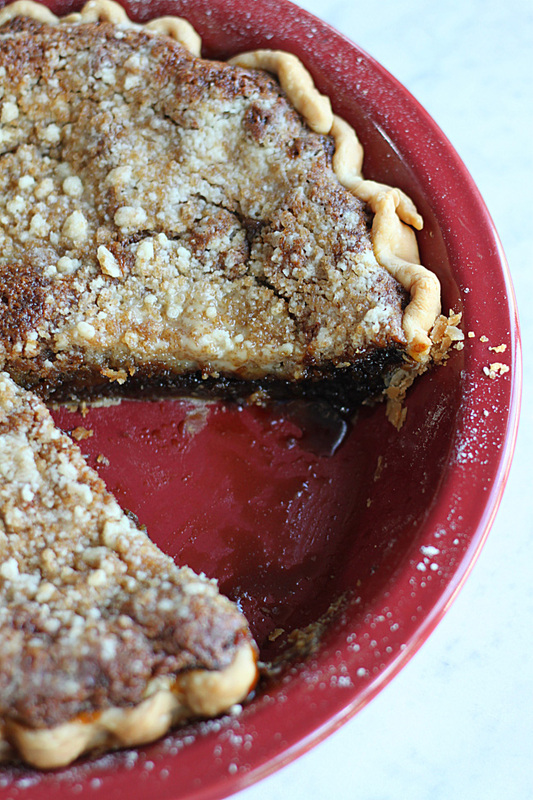 The two main types of shoofly pie are wet-bottom and dry-bottom. I don’t think I’ve ever had a dry-bottom one; it’s usually the wet-bottoms that are prevalent in our area. The difference is that dry-bottom is more cake-like throughout whereas wet-bottom has a cake-like top, finished with a syrupy bottom layer. 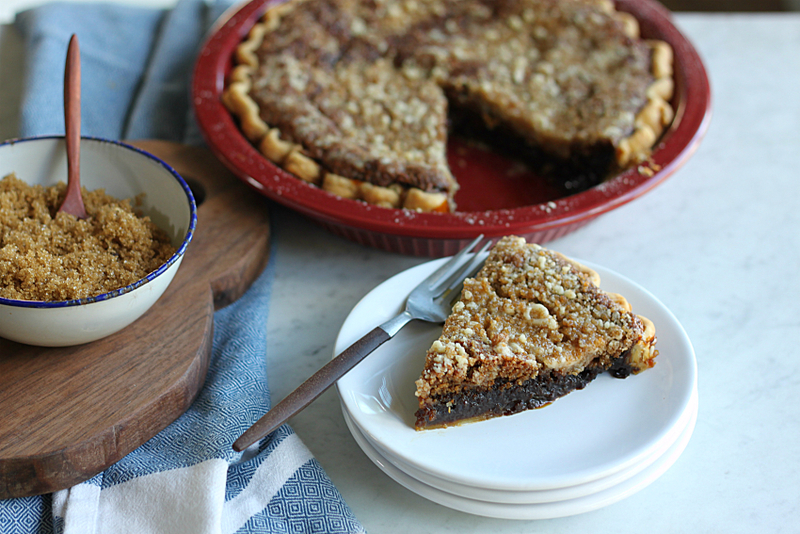 If you’re a fan of molasses-type desserts, you’re gonna love shoofly pie. It’s an easy recipe, but a different one. Just when you think, “This couldn’t possibly be right!” it is, so don’t fret. Just follow the instructions and you’ll be fine. 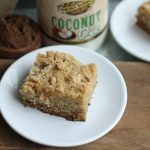 For the crumb topping, I used Golden Barrel Coconut Oil in place of the shortening that was called for in the original recipe. Just make sure your coconut oil is in a solid state. Coconut oil has a melting point of 76 degrees, so if it’s a warm day, stick the container in the refrigerator for a few minutes before measuring it out. You’ll cut-in the oil just like you would a normal crumb topping, until it’s about pea-sized in shape. Ooey, gooey with a crunch topping. That’s what this pie’s all about! 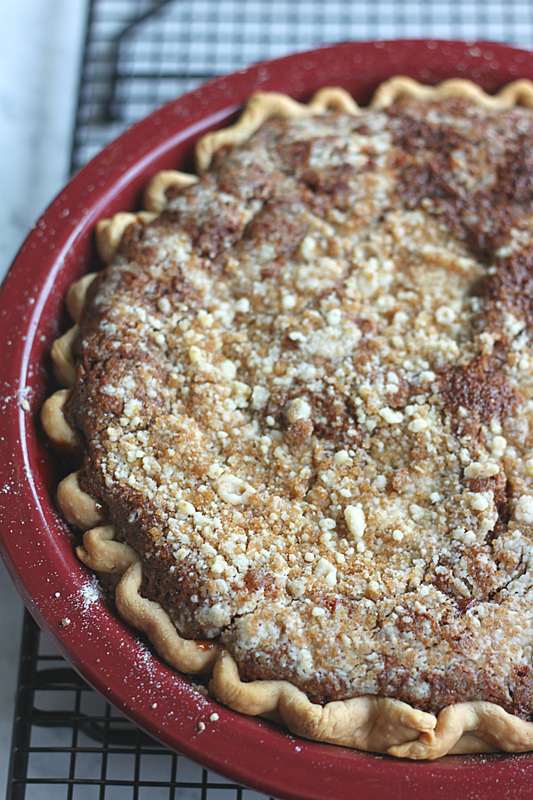 The Amish and Mennonites were and still are very frugal people, so this Pennsylvania Dutch shoofly pie was created out of everyday food staples that were readily available. From what I’ve read, they used to eat this pie for breakfast along with a cup of coffee. Now that’s a sweet way to start the day if you ask me! Cakey, crumby, gooey...this pie has all the texture and flavor associated with a long-lasting Lancaster County tradition. Preheat oven to 400 degrees. 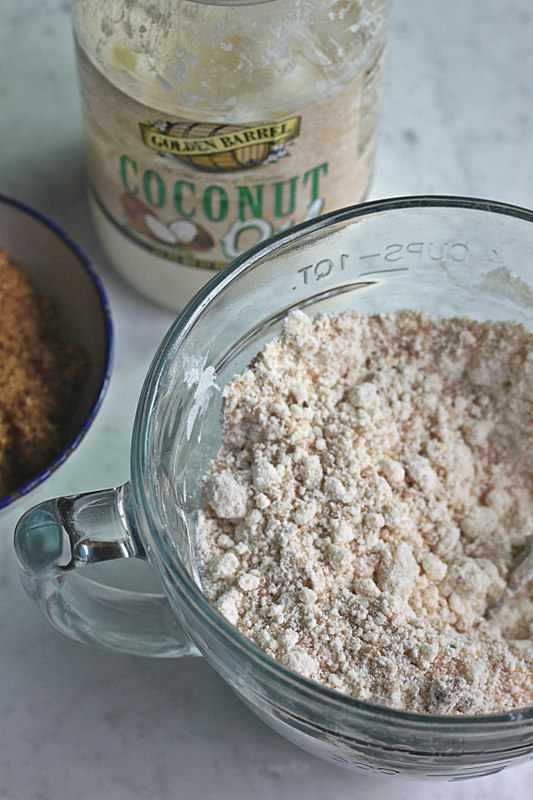 Mix together the crumb topping ingredients: flour, brown sugar, and coconut oil until pea-sized crumbs form. Set aside. 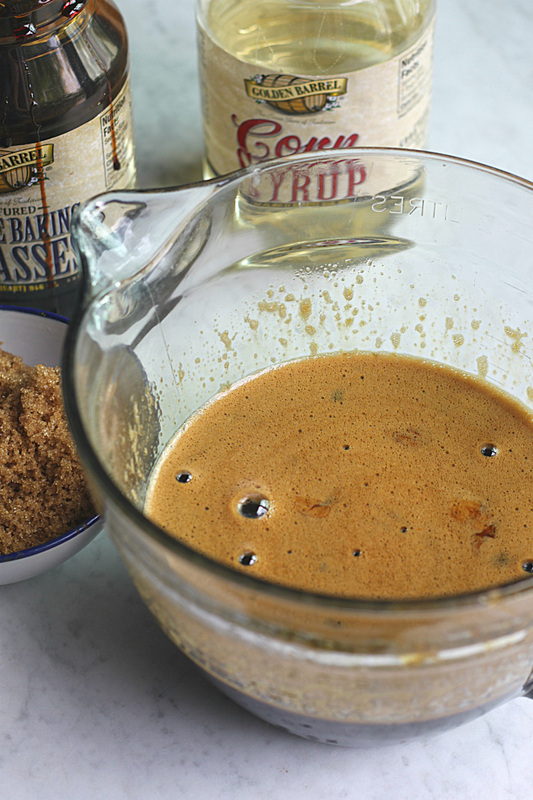 Mix together molasses, corn syrup, brown sugar and eggs until smooth. Dissolve baking soda in hot water. Slowly pour into the molasses mixture and stir until combined. Mix will be runny. Pour half of syrup into an unbaked pie shell, top with half of crumb mixture, then rest of syrup, finishing with crumbs on top. Bake at 400 degrees for 10 minutes, then at 350 for 40-50 minutes until set. Best served warm or cold with milk. 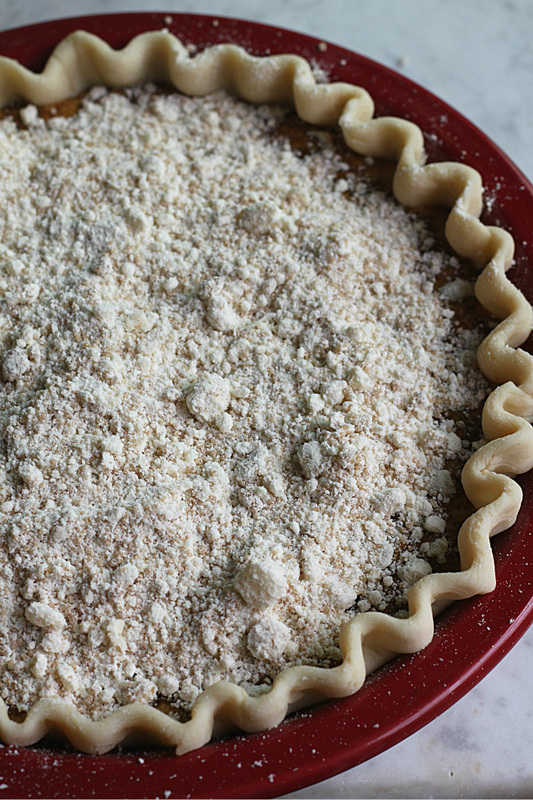 To get a dry shoo fly pie, I put 1/2 of the crumb mixture on the bottom of the pie, then I mix 1/2 of the crumb mixture into the liquid mixture and pour over. Not gooey at all, but delicious. You’re welcome, Carol! Hope you enjoy! May I use this recipe for a class assignment I am doing for my CNM/WHNP graduate program? I am presenting on the child birth and the Amish culture and would love to use this recipe in our Georgetown Cookbook we are creating! Sure, you are free to use this recipe as long as proper credit is given. Thanks for asking. I can’t believe I grew up in an area with lots of Amish and I’ve never tried this pie! 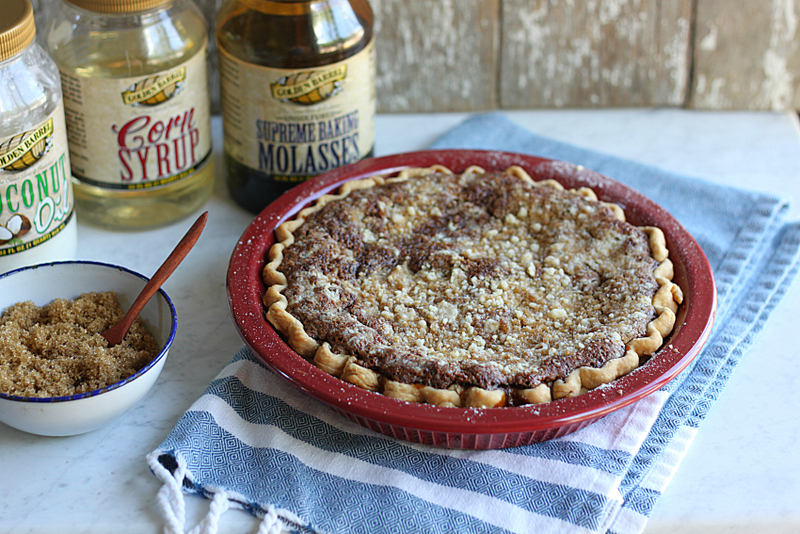 Does this particular recipe taste like genuine Amish shoo-fly pie? Since I’ve never had the pie before, I don’t know what taste to “look for” when I eat it. Thanks! Yes, it should taste just like the pie you would get here in Lancaster County. This one has a gooey bottom. Some shoo-fly pies have a drier bottom so its a matter of preference. I prefer the gooey bottom. There really isn’t any other pie to compare it to as its pretty unique. Give it a try!